you guys know i usually don't do giveaways or sponsored posts (and not because i have any moral or ethical objection to them...i just haven't gone down that road yet)....but i was so excited when 4moms invited me and bee to participate with other mamas in a blog tour for their new playard....and the chance to give one away to you too! but when max and i watched the video of the breeze we were instantly hooked. "we need that", max said. haha. if only for being able to push the button. and when 4moms sent ours to us in the mail, to be able to sleep in the box (which he did). one push down on the center button pops it open and a pull up on the blue tab will close it. it seems pretty perfect for grandparents/aunts uncles/friends who want to help but aren't used to newfangled baby gear. 3. For an extra chance, go "like" 4moms on facebook or follow on twitter @4moms! A winner will be randomly selected Thursday, August 30th! for all others, you can pre-order your own BREEZE now! p.s. thank you all so much for the well-wishing for max yesterday (and all the sweet talk on his outfit)! i couldn't wait to tell him all your sweet comments when he got home from school. but you should know, he took the cardigan off before we got into the car yesterday morning. he told me he looked nice but maybe too much like a store mannequin. haha. thank you so much everyone for entering! and congratulations, jackie! This would be perfect for my new nephew! I'm not a mom yet, but all of my friends have children. I would love to share this with them. Or, keep it in my closet for visitors until I have my own little darling to use it for! Mom fold up our current system when my daughter spends the night . Would love this for my brand new baby, Harper! That looks so easy!!! I have always admired the mamaRoo too!! I've been wanting that play yard! I've been going to their website and watching the video over and over again and thinking "I want this now." ps: We have the mamaroo and my baby is sleeping it right now :) It's amazing!!! I have a few friends who are preggos so I would love to gift this to one of them! What a wonderful invention! I totally agree playpens are so confusing and hard to do with one hand! I want this!! Love that MamaRoo - thanks for the giveaway! The colors are not heinous AND this would mark the first piece of baby gear in my house (aside from a Kanye onesie, if that counts). I would love this for our 2 month old! Oh wow, all of their gear is so nice! We have to go the re-used route on most of our baby items, but could definitely get used to something so simple and nice. I'd love to enter. Ooh, I want the mamaRoo too! Would love to win this breeze in the meantime! I'm expecting my first little in January and this website is awesome. Love the origami stroller too! Wow! What a great giveaway :) The breeze looks like a breeze. That mamaRoo looks awesome too. I'd love to win. Thanks to you + 4moms for the opportunity. Aww, such cute mom and baby! I love her looking up at you. I cannot wait! I'll be a new mom in October!! LOVE this!! I am a new mom with a 10 day old baby! I would love this! Thanks so much for sponsoring this giveaway! I have admired your blog for a year now and the tales of your beautiful family keeps bringing me back! Wow. I wouldn't have thought to register for one of those - but that looks awesome. I'm due in December and it would be perfect! Our girls are only a few days apart, my Iris was born on July 7th and we'd love to win this!! also, following 4moms on facebook! Wow! That would be amazing for our newborn. This looks like a dream!!! Great products. fingers and toes are crossed! Oh, I love the mamaRoo too! but this Breeze looks awesome. And Phoebe couldn't be any cuter. Following 4moms on Facebook too. alyssa1184 at gmail dot com. Love this Breeze, and the Origami stroller. The simplicity of use is genius! I Like 4moms of FB! That BREEZE would look OH SO GOOOOD in my living room! This would be so amazing to own! I would love the breeze,,.the mamaroo does look pretty awesome though! Hi Katie, I've been lovin' your blog forever and this product would make such a difference for my family! thanks for the post! Oh my, I can't say enough great things about 4moms and their products. They really understand what we need and they truly deliver! I'm always sweating by the time I've figured out how to put my play yard together, or away. No matter how many times I've done it before, I can never seem to duplicate the results without several failed attempts and some choice words! The Breeze would make life SO much easier! With baby number 2 on the way I can only imagine what life will be like with an infant and a toddler so I'll need all the extra hands I have at any given time. I would love to win this!! I really want the mamaroo and also the breeze, it looks so easy! I'm due in January with my first, and I wasn't sure if I should register for one of these for the same reason as you said, but this looks too good to be true. That is the most amazing baby stuff I've ever seen! Oooo we have the mamaroo and love it so another of their ingenious ideas of a product would be welcomed in our house with this new baby on the way! I love it! I fight with my current pack and play on a daily basis and it usually ends with me in tears! This is such a great product. I would L-O-V-E to win this Breeze! I'm sure being a mommy is not always a breeze, and being nearly 31 weeks pregnant with my first I am sooo overwelmed with all of the baby gear out there! I would be soo happy to win!!! xox! Their products are pretty amazing! We would absolutely love the Breeze, my 9 month old just started crawling and it's so hard to keep him out of trouble in a 3 story condo and lots of stairs! oh my gosh, the origami looks SO COOL! and the breeze/your pictures look incredible, too! BREEZE looks soooo effortless. I would love to have one. I already own mamaRoo and it's just amazing. I like 4 moms on FB. I love all their products! So excited about the Breeze! It is so cool how easy it is to set up!! i also "like" 4moms on facebook :) my fbook name is brandilyn haynes! We are due in December and don't have a play yard yet. The one we used for our son was stolen about two years ago. I've looked into these and liked 4moms on FB and Twitter. 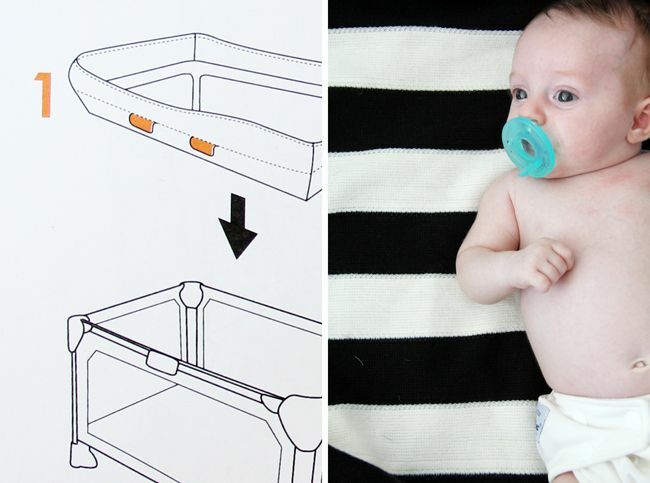 I love what they have come up with for parents and babies alike! It would be a huge blessing to win! I like them on Facebook and follow them on twitter! Just awesome!!! After dealing with our pack n play, the Breeze looks like it would be a dream!!!!!! And it's very sleek! Love it! I love the mamaRoo too! And the Origami. Really, I love pretty much everything 4moms makes. They are smart cookies over there! I like 4moms on Facebook too! I would love to win the 4Moms Breeze giveaway! I am going to be a first time dad in February and am overwhelmed by all the baby stuff there is out there. On that same note, I am absolutely ecstatic about becoming a father and have been researching the best items to get for my first born. 4Moms products seem to be amazing and I plan on getting all of them if possible. I showed my Wife the Breeze and she almost fell to the floor with how easy it seems. She said that is one of the most convenient ideas she has ever seen and I would know why if I had ever used a playpen before. Honestly, I don't want to use another playpen, I want the Breeze! I can be emailed at andrew.nickolaou@gmail.com - Thank you for the chance at this neat product to help parents and upcoming parents like myself transition into parenthood! I have also liked 4Moms on Facebook and followed them on Twitter! The Breeze looks amazing and easy to use! 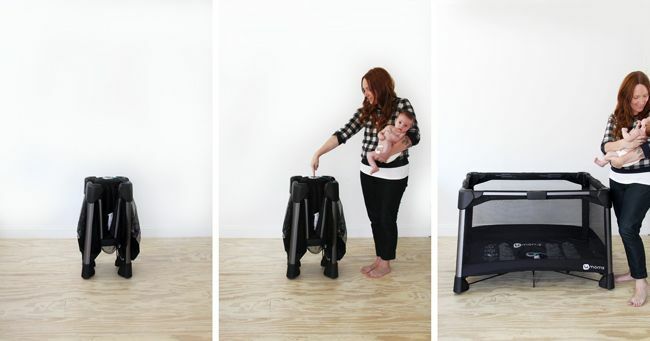 The origami stroller also looks awesome- it charges your phone! I was just reading about this playyard in one of my pregnancy magazines yesterday! This would be so amazing to win!! I would love the origami stroller! Winning the breeze would be such a blessing for our baby that is on the way! I absolutely love 4moms and all of the ways they make life easier for parents! We've used the clean water collection tub since our little guy was born in 2011 and we now use it with our little miss! I'm a 4moms fan on fb as well! Love, love, love 4moms! I see them as the "Apple" of the baby industry. I love their products! Esp. the Mamaroo!!!! I like 4 moms on fb! This would be so perfect for us!!!! We used to have a pack n play that someone "borrowed" and accidentally sold in a garage sale. So we're in the market for a new one as we have a newborn. We love 4moms! Thanks for the opportunity!!!! Fan of 4moms on FB! Love love this AND that mamaroo!! I've wanted a Mamaroo forever and now I'm in love with their Breeze. I can barely ever get my pack n play set up and usually I'm ready to throw it out after 30 minutes of setting it up! Definitely not fun when that's where my 4-month-old is currently sleeping until we move. Already a fb fan of theirs (Nicole Toscano) & I follow them on twitter @NicoleT1821! i would love this i have a 9 mth old and expecting so this would work for both babies.. I would LOVE to win this! I love 4moms products! I was lucky enough to get a mamaroo at my baby shower! I would love to make my husband's life a breeze! He is the one that is usually in charge of our little lady's furniture setup. wow, that mommaroo is pretty hi tech. I think I might rather have the breeze though. It always takes me 5 min to figure out how to put up & take down a pack n play! I would love a Breeze! They look so easy to use. I checked out the website and, man, those Origami strollers are cool. 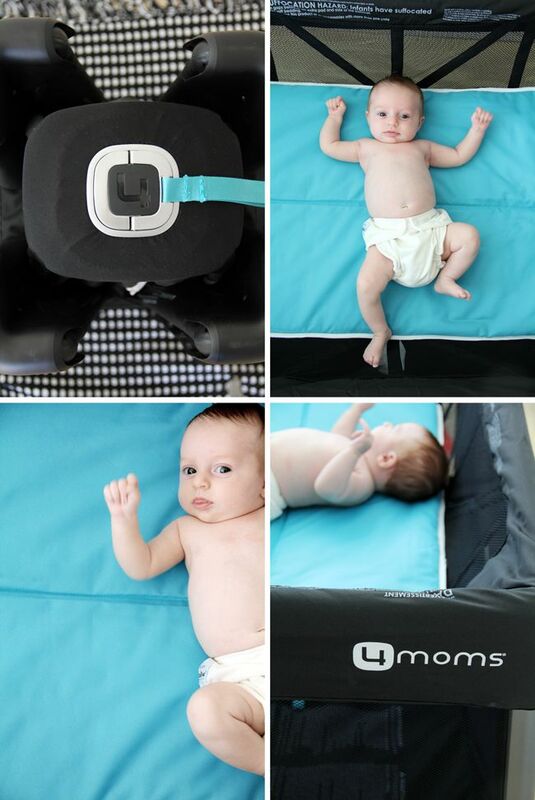 I also like 4moms on Facebook..
love the bassinet feature! I was just talking to my sister, who is due in March, about playards. She said that she's not nervous for her first child as long as playpens are still around, but we weren't sure if they were. Glad to see they're still alive and EVEN BETTER! Thanks for this opportunity, I know she'd love the Breeze! I would love to win a breeze!! Pick me, Pick me!! Very cool, it looks attractive too which isn't always the case. Oh also, I liked 4moms on FB! i would love the breeze, but i want a mamaroo too. This is so cool! I love how there are such modern designs available for Moms now. I checked out the Origami stroller too...so cool how you can charge your cell phone while you stroll around! WOW...those baby products are suuuuper fancy. The stroller page looks like a car commercial. I think the breeze is my fave! love this giveaway! i have had the mamaroo bookmarked for a while! love all of the products! especially the stroller! I love this giveaway! I would love to have one of these! And I've liked 4Moms on FB! One of these would be great to have for our little boy coming in November!! We are TTC #2 and when the little one arrives I know I'll need an easier to use play pin. Oh my word! I'm so happy you've now introduced me to 4moms! All of the products look incredible! A power stroller? A "rocker" that moves like mama?! Genius! I would absolutely LOVE to win the Breeze! I couldn't like the 4moms Facebook page fast enough. Thanks for this amazing giveaway! I would love to win this for my lil guy who is coming soon. I love 4Moms products- we had a Mamaroo when the twins were little and this looks like an awesome play yard! thanks! Already a FB and twitter follower (farrah r, Momofthreeunder) thanks! I would love this! My husband and I are getting ready to travel for the first time with our 12 weeks old. This would make life so much easier! I like 4moms on facebook! 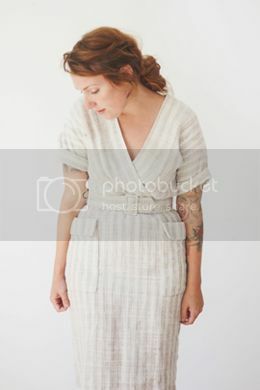 This looks so easy, and I LOVE the fact that the sides are breathable! That's what stopped me from letting my baby sleep in a normal pack n' play, was worrying that he'd roll up next to the sides and suffocate! Love this! I'm also a fan of 4moms on Facebook!! Really fun website. I'm far from expecting but my best friend has a little one on the way. Would love to gift it to her! I love this! SO easy to use and quick to set up and take down. Perfect. Wow this is awesome. I really need to get one soon. Hope I win. This is a necessity! One of my poor brothers has scars into adulthood from pinchy parts when we were younger. Oh the things they have for babies now just blows my mind! I would die for one of those origami strollers!! My little sister is about to have her first baby and could really use that portable crib. I would love to win it for her to give her at her baby shower! You definitely want the mamaRoo! We love it. Already following 4moms on FB. I would love to win this! I have been eyeing up the MamaRoo too!